Truro Center for the Arts at Castle Hill. It’s summer and no better time to take a trip to Cape Cod and gain some artistic knowledge while enjoying the sun and the sea. The timing finally came together for me to make this dream come true and I was excited to be taking a Process: Meaning & Making workshop with Deborah Dancy at the Truro Center for the Arts at Castle Hill. My three collage sketches set the stage for the week. Day one the assignment was to create a collage sketch from pieces of ephemera that Deborah had brought to get us jump-started. Books, magazines, coloring books all for the taking along with a little image transfer to boot. Our collages needed to be boiled down to only three to five pieces strategically designed to be the inspiration point for our finished pieces. 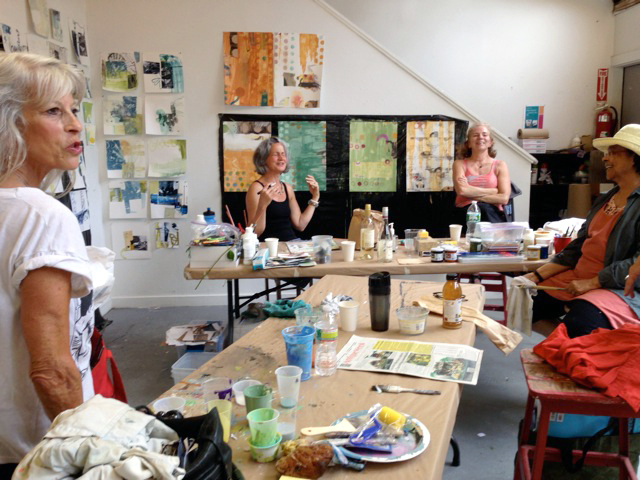 Alisha Keller and Trish Berube working in the studio. Our afternoons were spent toiling away with the intention to play with materials and force ourselves into the uncomfortable unknown with our art projects. Working with various pieces of papers, sticks, paints and tools like squeegees and paint rollers-anything was bound to happen. Part of the process was connecting with the other workshop participants. It was the group consensus that we all pushed the boundaries and created pieces that were surprisingly personal and unexpected. Sisters Maddie Goldman and Ellen Hirsch were an inspiration to us all. Deborah Dancy would give us focus and direction in the morning sessions by cutting our pieces, adding things and making comments. In the afternoons we were busy figuring out what she told us. By midweek things were moving along at a fevered pitch. 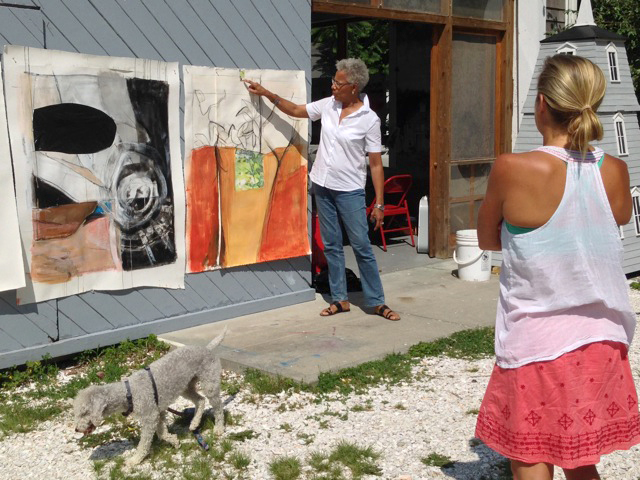 Deborah Dancy critiques Trish Berubes art pieces. By the last day of our workshop the group had pulled together enough work for a critique and Deborah gave each of us a thoughtful commentary and direction. The outcome was extraordinary in the vastly different and unique pieces that were created. 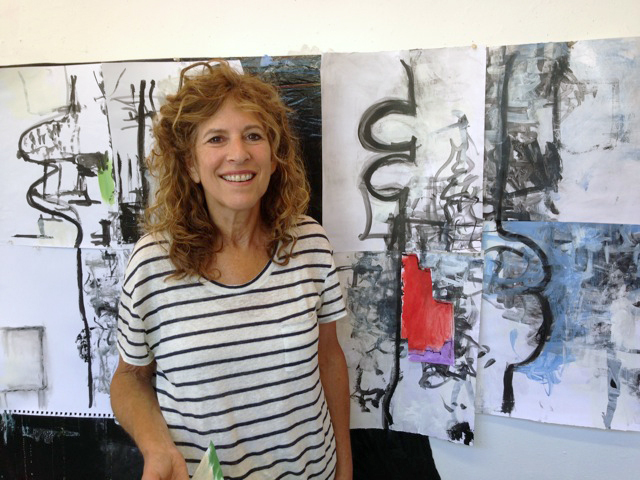 Ellen Hirsch with her final pieces. By the end of our workshop we all felt challenged and excited about new possibilities for the future. The cat was out of the bag and we would never be the same again. 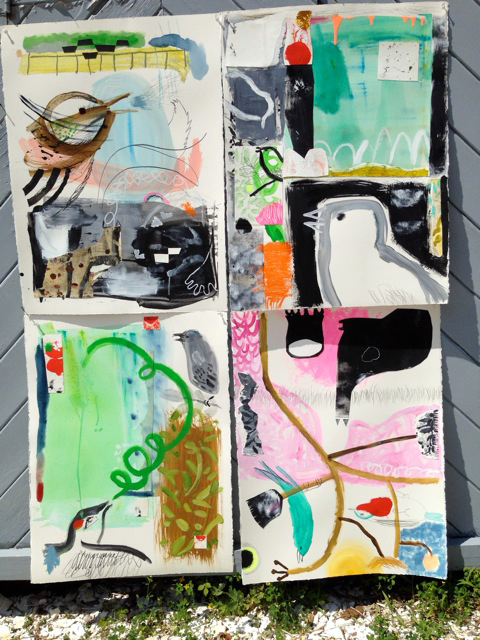 Each day I worked on a new painting collage based on the sketches that I designed earlier in the week. When it was time for my final critique I told Deborah that I felt like I wanted to work bigger. She promptly had my four pieces, with one upside down, tacked up together on the barn door to make one large collage that would measure 44″ x 60″. I’m inspired. Thanks Deborah. 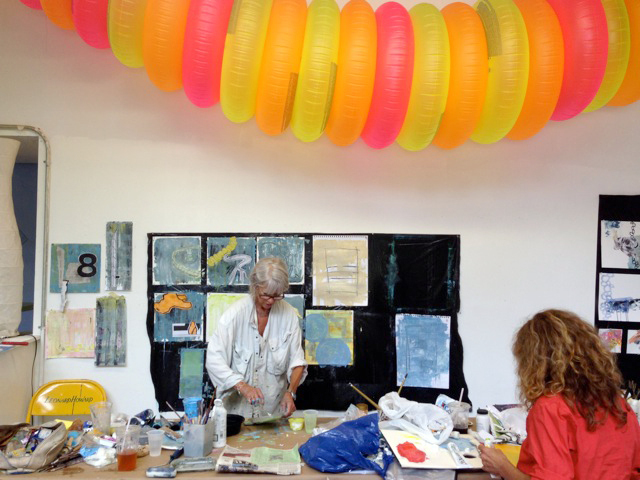 You are currently reading Creative Process with Deborah Dancy at donna ingemanson studio.